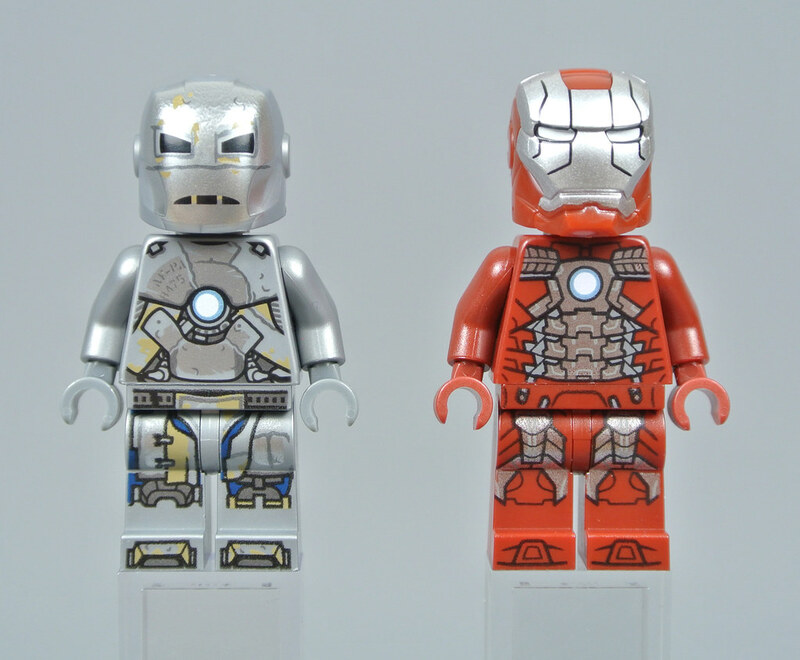 Fifteen excellent Iron Man minifigures from the Marvel Cinematic Universe have been produced since the range began in 2012 and these figures are certainly collectable. 76125 Iron Man Hall of Armour is therefore an exciting set, introducing four new Iron Man armours inspired by various different movies! This rendition of Tony Stark's workshop appears similarly impressive, featuring details and references from across the entire Marvel Cinematic Universe. 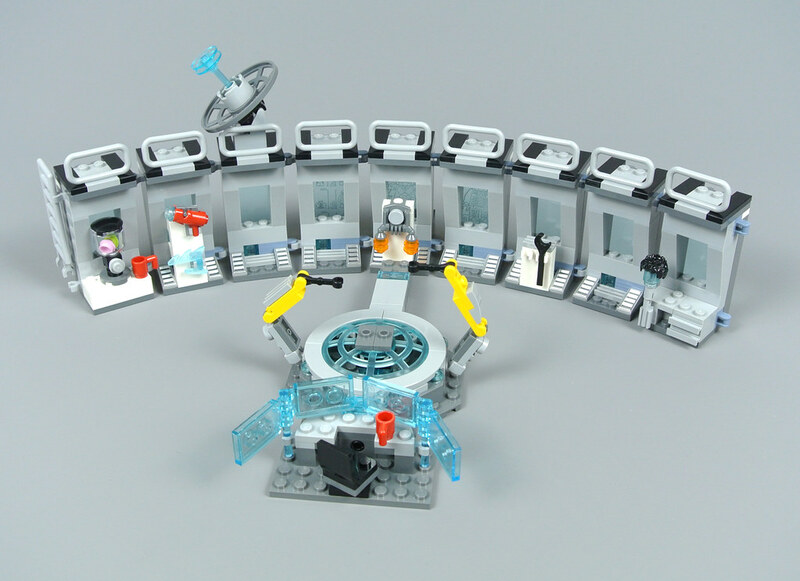 Furthermore, the set includes 524 pieces and it costs £54.99 or $59.99 so seems to offer reasonable value, especially given the inclusion of six minifigures. Iron Man was released in 2008 but the Iron Man MK I armour remains exceptionally popular. Its pearl silver colour scheme looks superb and I like the dark tan and dark blue highlights across the torso and legs, faithfully replicating the crude design of Tony's original armour. However, my favourite details are visible on the back where Stark Industries branding appears beside an oxygen bottle. An entirely new helmet would have been ideal but this component is a suitable alternative and the printing is lovely. An attractive combination of metallic silver and dark red dominates the Iron Man MK V. This armour appeared during Iron Man 2 and includes remarkable detail, especially on the torso where numerous small panels reflect its portable design from the film while contrasting with other armours. The helmet includes a hinged faceplate which features some black streaks and the white eyes appear striking too. Iron Man MK XLI was introduced during Iron Man 3 and is commonly known as the Bones armour. Exceptional mechanical detail is visible beneath the golden frame which supports the armoured suit and this continues onto the legs, corresponding precisely with the movie. 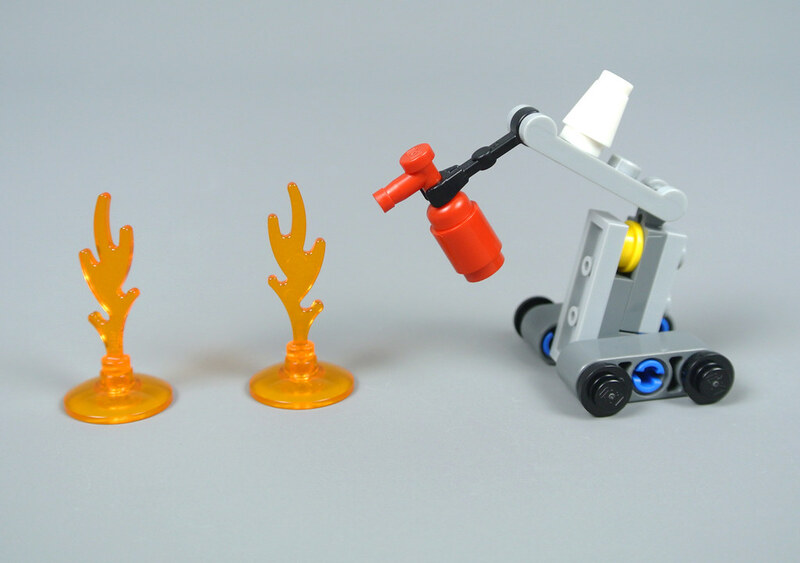 All three minifigures would have benefited from arm printing but I am still impressed with each distinctive design. While the earlier armours include trans-clear heads beneath their helmets, the Iron Man MK L armour is actually worn by Tony Stark. This double-sided head was originally created for the Avengers: Infinity War range and looks marvellous, featuring a pale blue heads-up display and two different expressions. The helmet is decorated with matching pale blue eyes. 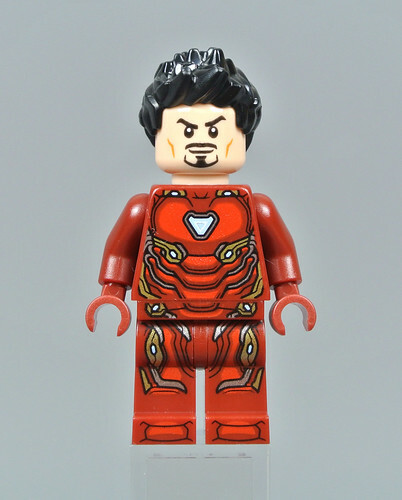 In addition, this set contains a black hair piece so you can display Tony Stark without his helmet. The armoured suit appears sleeker than its predecessors, featuring more curved shapes and a distinctive triangular Arc Reactor. I love the metallic gold and silver highlights as well as the differing red shades which further convey the streamlined shape of the Mark L armour during the movie. Two marauding Outriders complete the minifigure selection. 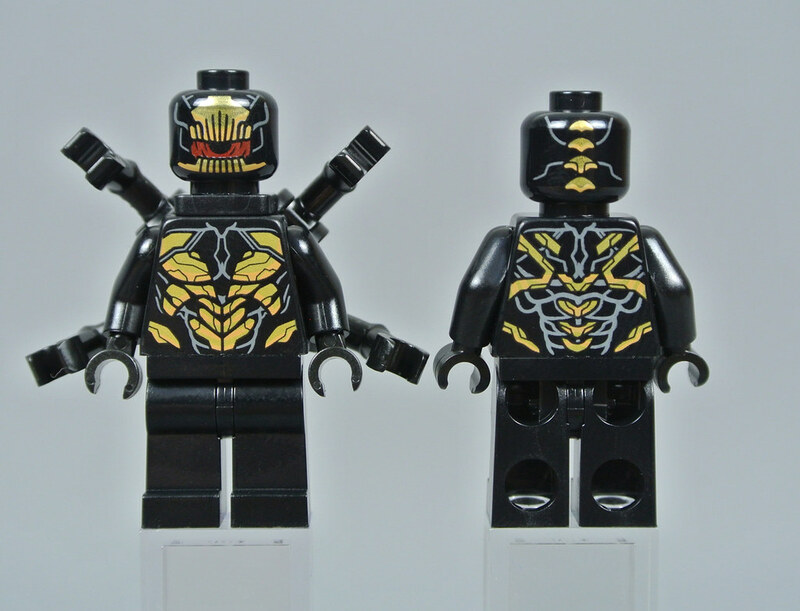 They appear in numerous Marvel Super Heroes sets and are definitely my favourite army building characters from the Marvel range, featuring attractive golden armour and a dark red mouth. Four additional arms are connected to their back and these are individually articulated so are ideal for creating dynamic displays with the Outriders. Iron Man can deploy armours for any eventuality and the Mark XXXVIII suit, more frequently known as Igor, is primarily intended for heavy lifting. 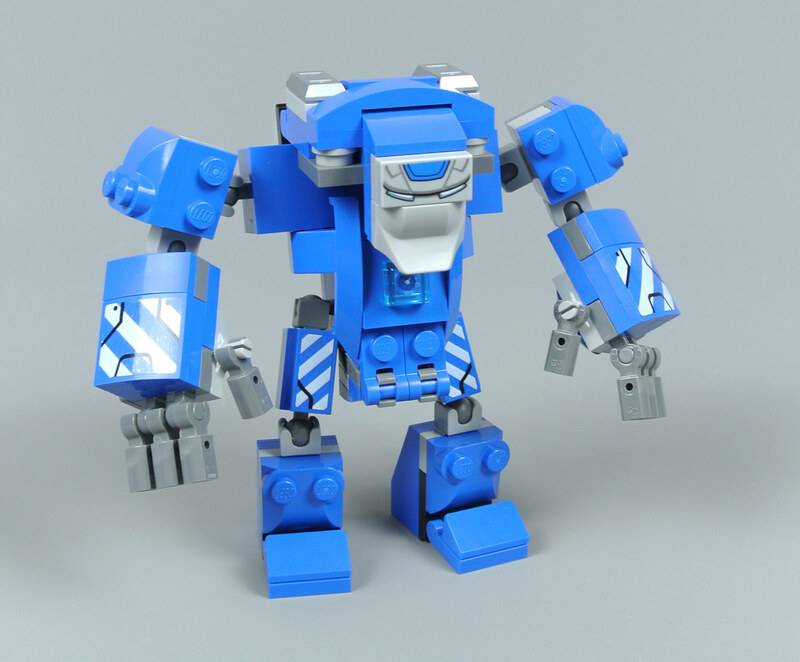 It is accordingly larger than almost any other armour and the figure measures 9cm in height so is significantly taller than standard minifigures. Its scale is not perfect but the model is fairly detailed, featuring white hazard stripe stickers on the arms and legs. 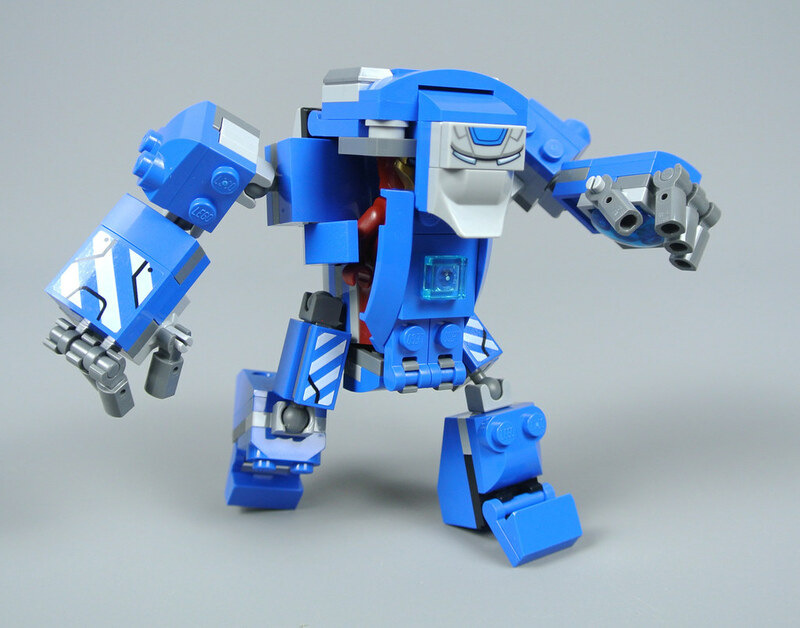 The armour is extremely articulated, featuring ball joints at the shoulders, elbows, hips and knees. In addition, the toes are attached using hinges which stabilises the figure and its fingers are individually articulated. This rendition of the Igor armour therefore offers brilliant play value and feels fairly tactile, although its appearance could certainly be improved around the head and shoulders. An excellent printed tile forms the eyes while the lower half of the head is represented by a 2x1 bow element. This design is not particularly effective as it does not really capture the shape of the source material. On the other hand, I love how the body opens to reveal space for Iron Man inside. He is not completely enclosed when the head and torso are folded which is unfortunate but this is an enjoyable function. Dum-E has previously appeared in 76007 Iron Man: Malibu Mansion Attack but this model is unique and looks good. The black wheels are accurate and the articulated arm includes three joints which is perfect. A white cone forms a dunce cap and Dum-E carries a fire extinguisher in preparation for any emergencies. Two flames are provided so there is actually a fire to be extinguished on this occasion! Tony Stark keeps each Iron Man armour in his workshop and this location appeared prominently during the earlier Marvel Cinematic Universe films. The model consists of nine sections which are linked using hinges, allowing you to separate them easily or change their angle to form wider displays. Furthermore, you can bring them closer together, thereby creating a smaller ring that provides little room for play but looks superb on display. An attractive trans-light blue platform is situated at the centre of the chamber, reflecting its layout from the movies. 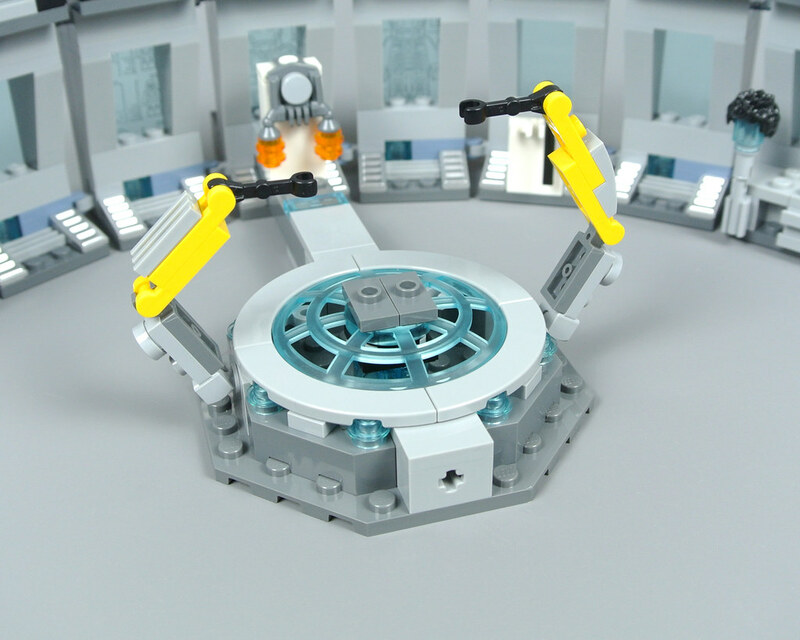 Both the stage and Tony Stark's desk are attached to the wall using Technic axles so they can be separated and rearranged. Another attachment point is hidden behind the wall which is slightly odd but any options for customisation are welcome. Moreover, the modules are designed to be stacked so you can construct multiple levels, corresponding with the 'Wine Cellar' that was created for Iron Man 3. Removing the bluish grey handrails leaves space to connect the armour bays vertically and open studs are provided to attach the displaced handrails, as demonstrated below. The adjustable dish can also be removed with ease. Tony's desk includes a rotating chair, a red mug and four holographic displays. Stickers are applied on each display and they are extraordinarily detailed but cannot be distinguished easily against trans-light blue parts. Nevertheless, I like the display identifying Agent Coulson as a blocked caller and the virtual keyboard is accurate when compared with its appearance during Iron Man. The circular platform is fairly simple but it looks magnificent. 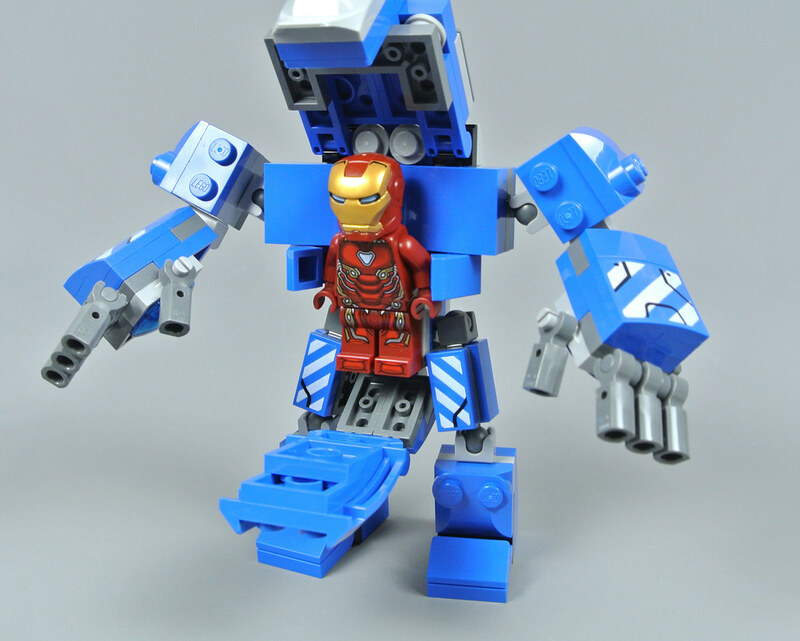 The rotating function works perfectly and two robotic arms are included, matching earlier Marvel Cinematic Universe films where Tony's armour required external assistance for disassembly. Each arm features two hinges and a ball joint, providing an excellent range of motion, but they cannot effectively grip an Iron Man helmet, unfortunately. 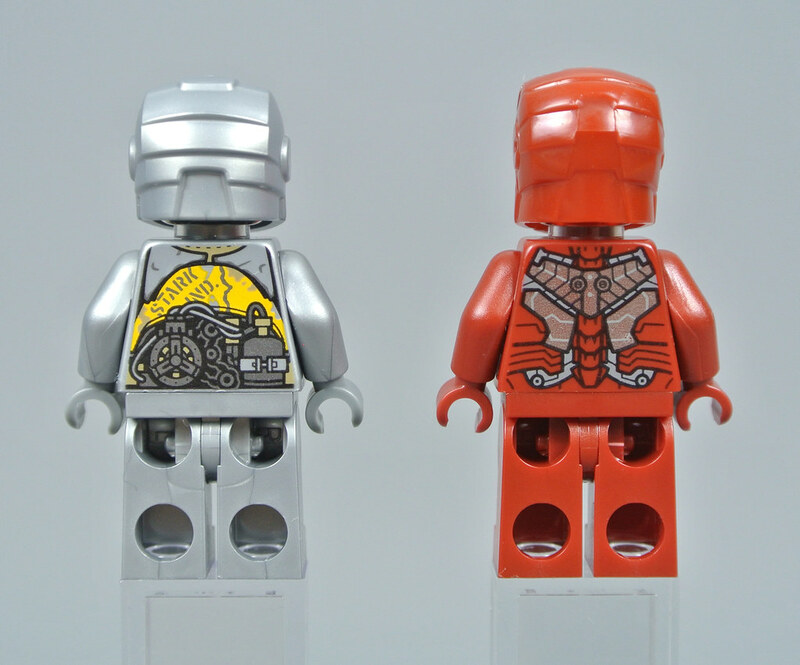 Clips are used to connect the nine armour bays and these are all designed around the same structure, distinguished only by the addition of accessory stands and stickers. The blender containing lime green and pink 1x1 round plates makes reference to Iron Man 3 while two unusual weapons are fitted on the neighbouring clips. The red stud shooter presumably represents a proton cannon while the trans-light blue energy blade can be connected to the Mark L armour, matching Avengers: Infinity War. A substantial jetpack occupies the central bay and there is enough room for a wrench as well. 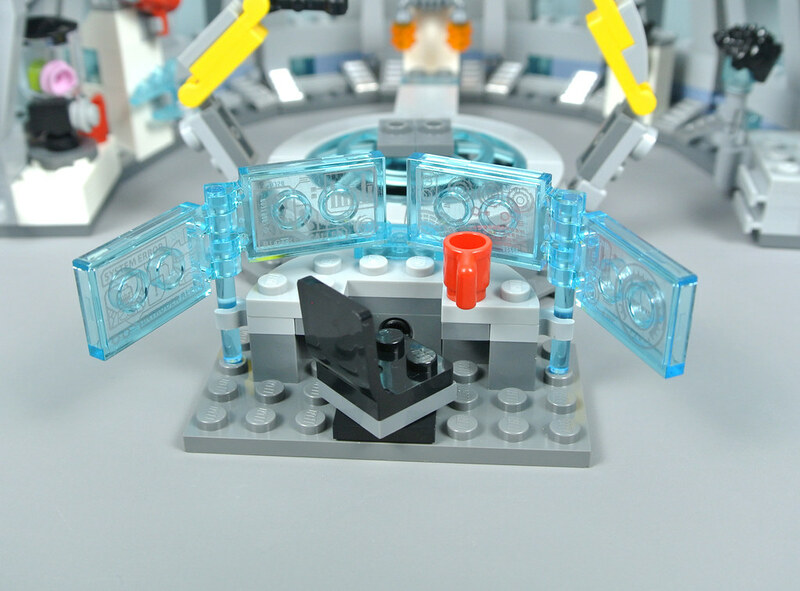 These racks can be removed very easily to provide more slots for minifigures and I appreciate the additional accessories. However, their white colour scheme does not match the environment. 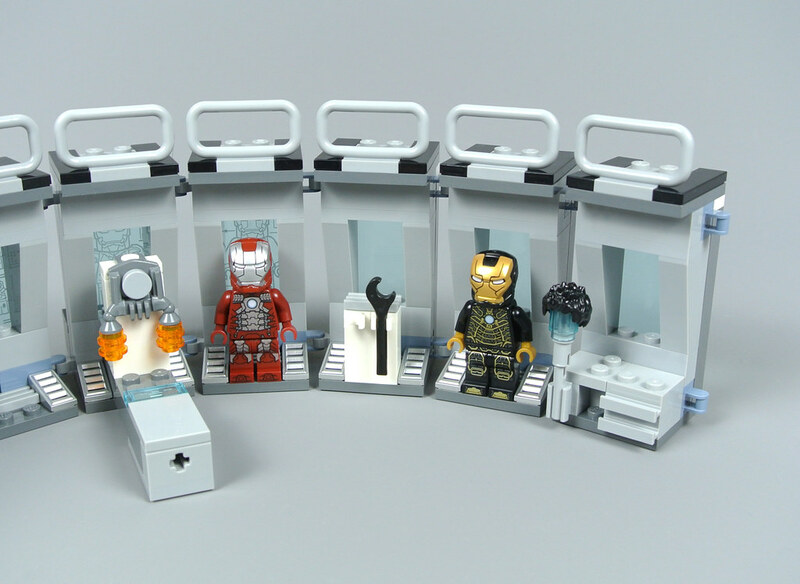 Tony's workbench looks great though, incorporating a stand for keeping an Iron Man helmet or the hero's hair piece! 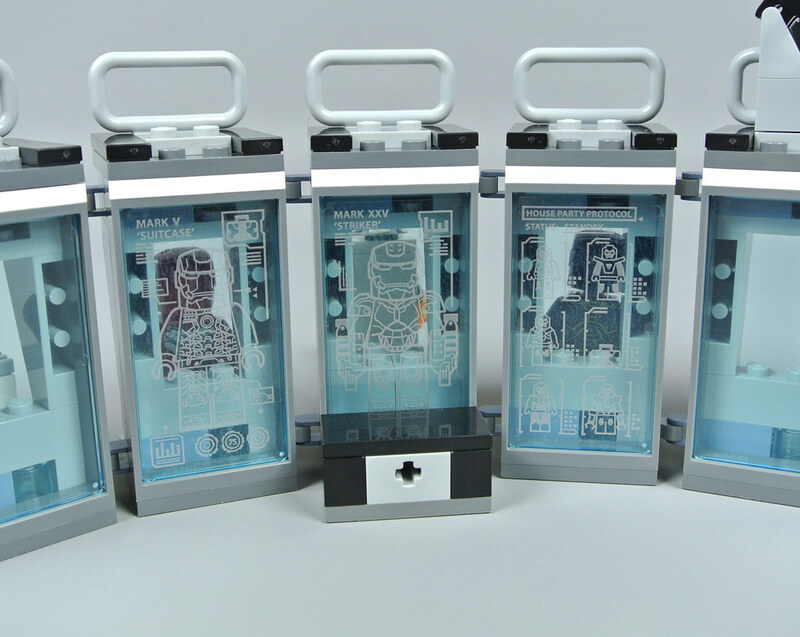 Stickers are visible through the three central bays but these can be viewed more clearly from behind, featuring the Mark V armour, the Mark XXV armour and the House Party Protocol. 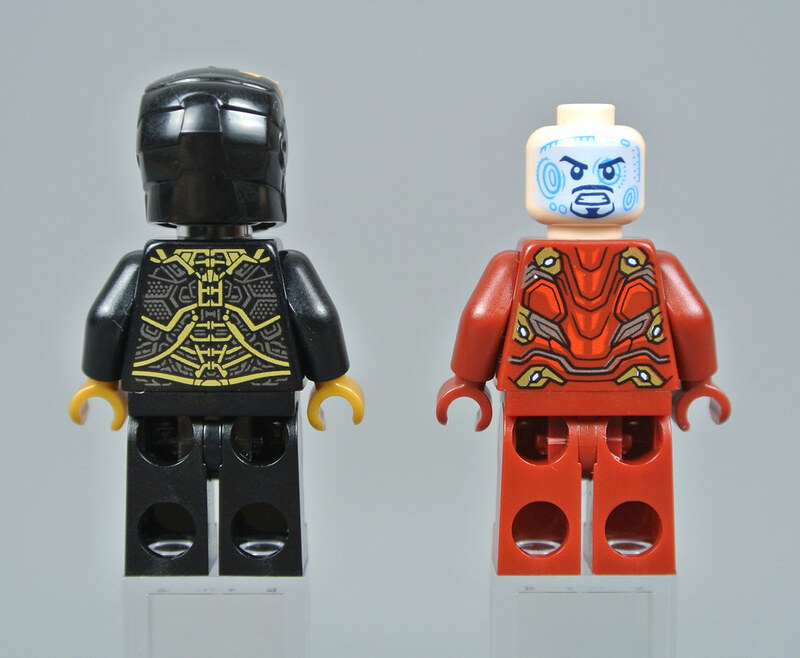 These designs are fantastic and certainly capture the futuristic aesthetic of Tony Stark's workshop, although it is a shame that the 'Striker' and 'Red Snapper' armours are not actually available, despite appearing here. 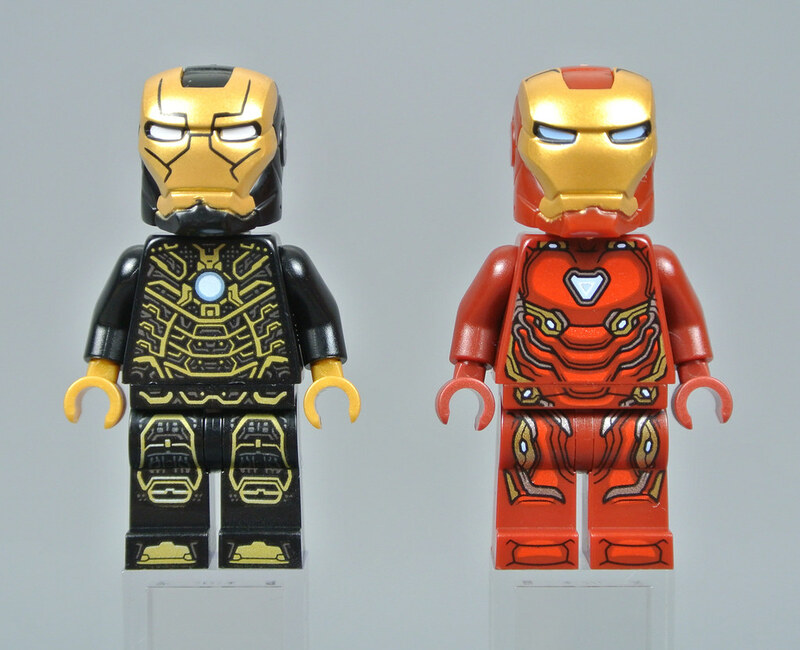 Some disappointment surrounded the unveiling of the Avengers: Endgame range but 76125 Iron Man Hall of Armour is an impressive set. The minifigure selection is excellent, including three new armours which are among the best that LEGO has produced beside existing characters that look fantastic. The actual Hall of Armour is similarly appealing and its numerous customisation options are enjoyable. The unusual Mark XXXVIII armour is probably my least favourite aspect of this set, although I think it would be difficult to improve upon this design without creating new pieces. Providing adequate space for a minifigure was important and the articulation is notable. This set costs £54.99 or $59.99 which is reasonable in my opinion and I would certainly recommend adding it to your collection. Just got this set, and I'm rly excited to open it! Would it be possible to implement a feature where reviews, database entries, and any other announcements about sets from (selectable?) films that haven't come out yet are hidden? More than any other movie I've been avoiding anything that could spoil this, including trailers, and I don't even want to know the names of the sets for this movie because I don't want to know anything about what is or is not in it. As much as I like constructables instead of molded pieces, Igor definitely should have been a bigfig. This one is just plain ugly. The price doesn't seem so reasonable to me. Seems like a very expensive display stand. ^I am kind of in the same boat. On one hand, this is a scene I have wanted in Lego ever since the first promos for Iron Man 3 started back in 2013 or so... with two figures I have wanted since the Super Heroes line launched. but at the end of the day it is just a very fancy display stand. 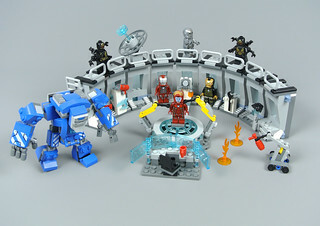 So I am really torn, I want this, I want to expand it to be big enough to house more of my Iron Man/War Machine figures. But... I also know my purchase really is just a big display stand. Also in the review, I thought the Wine Cellar was shown in the film? Briefly, but I swore Tony walked down there to pick up a bottle and we got a look at all the armors down there. Great set! You should include a picture of it filled up with other Iron man suits! I've bought a total of 4 of these sets and I have almost every single Iron Man, War Machine, or Ultron variant displayed in it. If you bend the 9 bays around, it forms a perfect half circle. I have that in 4 different layers. I needed a few extra parts to complete this from my collection, but it looks really good on display. I feel I should point out Lego doesn’t have a great track record when it comes to revealing plot details. There’s no guarantee anything we see in these sets will appear in the films outside of concepts so general they hardly count as spoilers at all. I initially turned this set down, but the review here has reopened my interest. A good set but I only want the Police Station from this wave and for a personal project I might add. I really don't get why the Dum-E in this set is a downgrade from "30452-1: Iron Man and Dum-E"
Yes, I found somewhere on the Internet which is discussing Endgame without being an absolute spoilerfest! I got this set last week and love it. I’m waiting for the Avengers tower GWP before I get any of these sets, and this may be the only one I have any interest in. I really don't want to complain as I truly appreciate your reviews, but when you 18 days ago announced that reviews of the Avengers: Endgame sets would be published "very soon" https://brickset.com/article/42970/ I got rather excited and kept checking your site several times a day the following days, without any of those showing up. Almost 3 weeks later I've already watched Jang's reviews of them all. 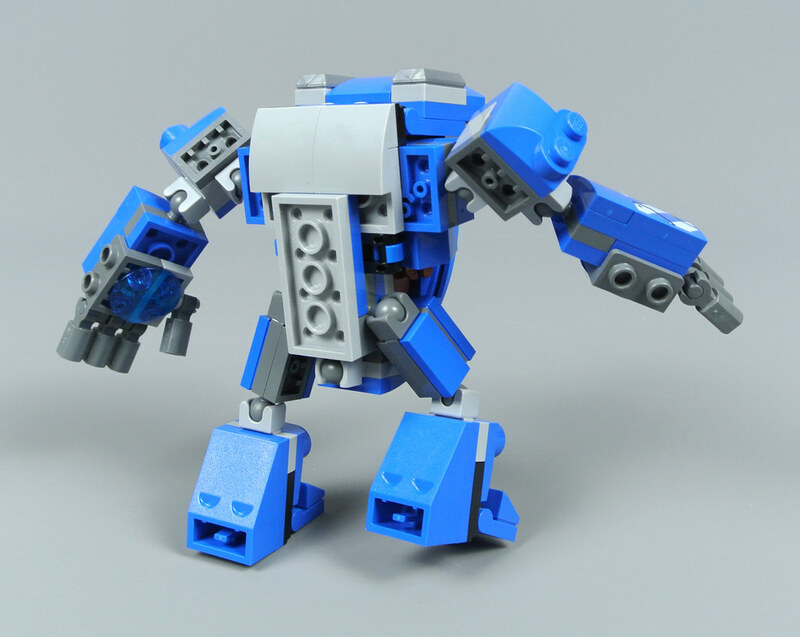 Okay, if they wanted to make Igor with space for a fig on the inside, why didn't they use one of the old Nexo Knight battle suits? Maybe it didn't quite have the proportions they were looking for, but it looks so much more streamlined than this mess. 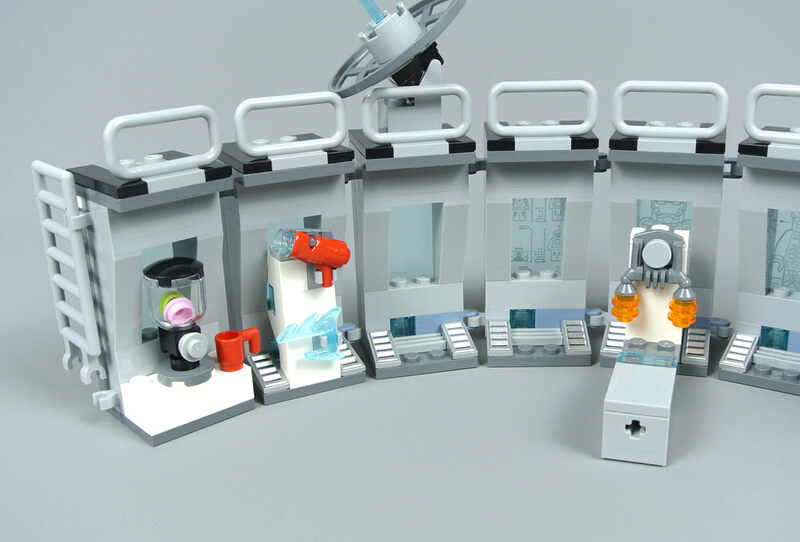 Beyond Igor, the rest of the set looks decent; the build isn't super fabulous, but it is temping to get a couple for display purposes. 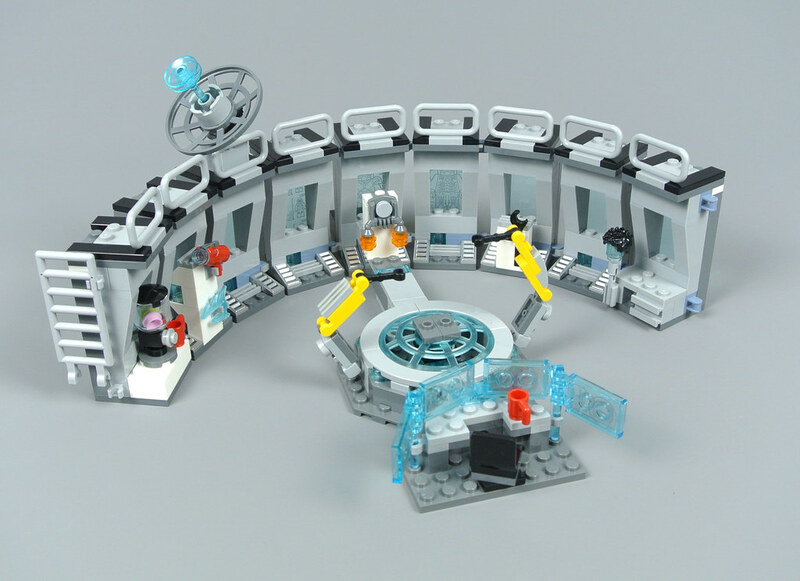 @Mr Classic - I cannot review everything immediately and chose to focus attention upon the Star Wars theme during the first half of April as there seemed to be greater interest in those sets. Reviews of the Avengers: Endgame range will continue as the film approaches. Endgame spoiler alert!...Tony Starks hair is just a wig. Great review! Picked this one up and am looking forward to the build and to have it on display. 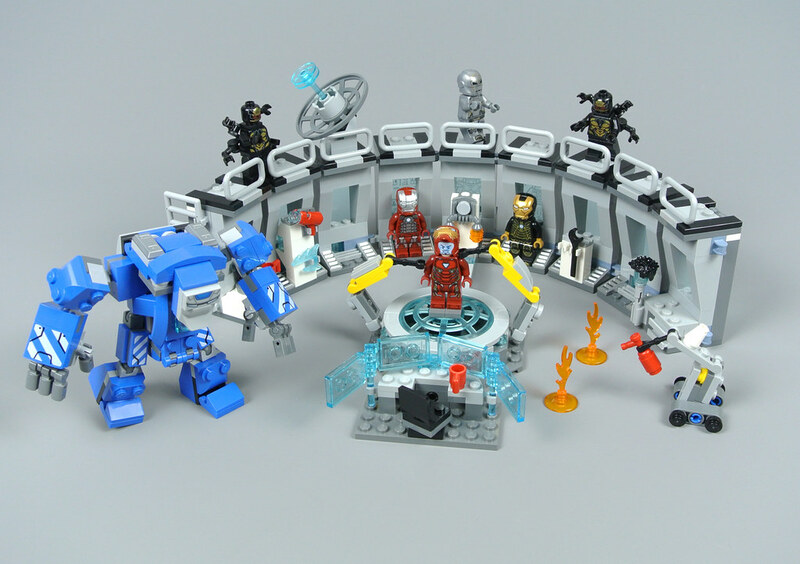 This is a great LEGO Marvel set but it feels more like a highly overdue "Iron Man 3" set than an "Avengers Endgame" set. Kind of wished they'd released it between movies and done another Endgame relevant set here, without losing what's great about this. This is a nice looking set. Personally I think that it would go well with the Iron Man lab model that Lego Club provided building instructions for, six years ago. If you haven't seen it yet you should check it out. How does one go about joining the Lego Club? Have they produced any other Super Hero (Marvel or DC) plans? Just bought it this morning. On sale at Target, plus got a $10 Target gift card. 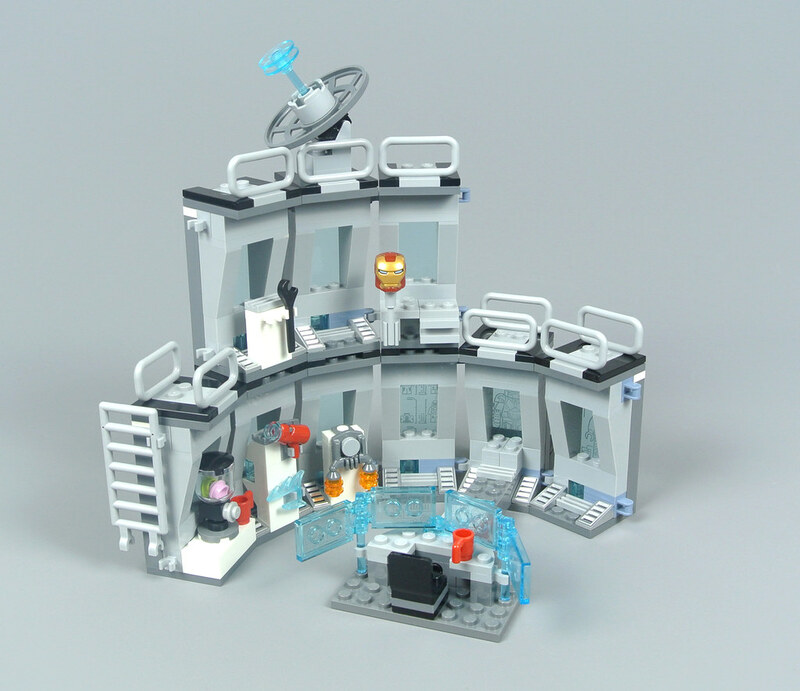 I plan on buying the Endgame sets from LEGO.com tomorrow in order to get the Avengers Tower GWP. It’s more expensive than buying at Target, but the GWP and points make up for it. The way I figure, the GWP is an easy $80 plus shipping from eBay; that wipes out the savings and gift cards from Target. I’m guessing there are at least two additional sets for Endgame that they can’t sell now due to spoilers, so the points I’ll earn will go towards that purchase. @MutoidMan: The Lego Club doesn't exist any more it was (sort of) replaced by Lego Life the other year. As for other Marvel/DC builds I'm not sure. It looks like we both have some digging to do. Thanks. Guess I’m going to begin digging. @MutoidMan: Happy to help. I'll let you know if I find anything. Have to say I liked the look of this one from the start. Mainly the Mk I suit that I love but I think the whole thing looks pretty reasonable. Be careful with the "robot" arms and expensive torsos. I broke a torso piece trying to remove them.